The Decibel Metal and Beer Festival combines two mighty things that people either love or hate; metal and beer. For those people, like myself, who loves both, know that there is a place for us. This year’s festival is heading to Los Angeles in December for its annual event according to PRP. The two-day monster weekend, which is set to occur on December 1st-2nd at the Wiltern in Los Angeles, California, is organized by the monthly metal Decibel magazine and judging by the name as mentioned above, it offers exactly what it promised; metal and beer. Today, the first wave of the musical lineup has been announced, and it features some massive acts including Testament, who will play a special set of their “New Order” and “The Gathering” records in full. 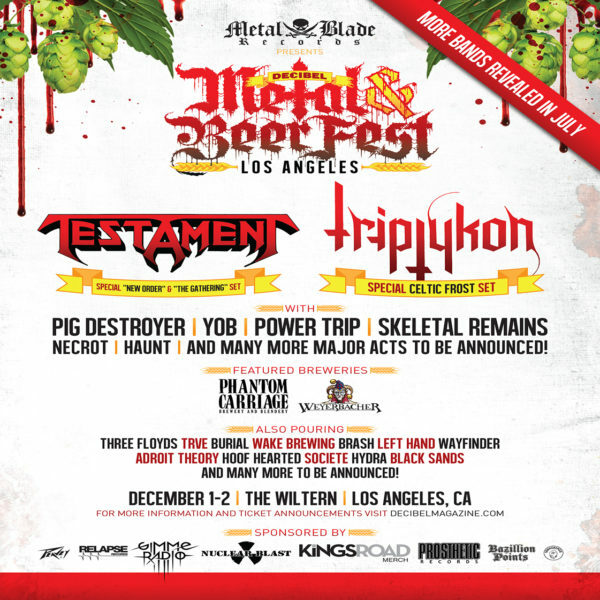 Triptykon (playing a Celtic Frost set), Pig Destroyer, who is scheduled to release their new album, Head Cage in September this year, YOB, Power Trip, Skeletal Remains, Haunt, as well as the Oakland based Death metal band Necrot. Additional acts are set to be announced sometime in July for the second wave. As fans headbang to their favorite metal bands, malt lovers will headbang to their favorite beers. Some of the metal breweries from all over America will come together at this year’s festival including Three Floyds (IN), TRVE (CO), Weyerbacher (PA), Brash (TX) Adroit Theory (VA), Burial (NC), Hoof Hearted (OH), Societe (CA), Left Hand Brewing (CO), Phantom Carriage (CA), Hydra Brewing (SD), and Wayfinder (OR) are all set to return. There are a couple of new breweries making their Decibel debut including Wake (IL) and Black Sands). The brewery owners converging this year in Los Angeles are all metalheads themselves, and while they serve ticket-goers their beverages, they too will be headbanging along to the music. 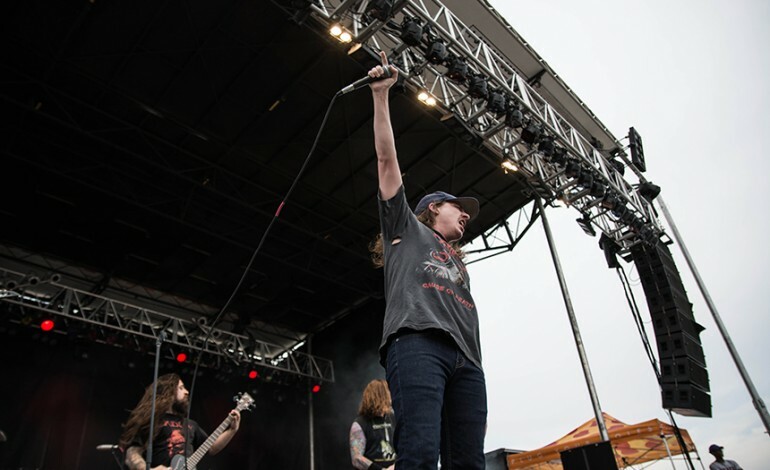 Early this Spring, Philly hosted the Decibel Metal and Beer Festival which was held at The Fillmore and featured performances by Carcass, At The Gates, Mayhem, Monster Magnet, Integrity, Pallbearer, Repulsion, Dream Death, Sumerlands, Spirit Adrift, Evoken, Full of Hell, Spectral Voice and All Hell. Those who wish to cross Decibel Metal and Beer Festival off their bucket list should take not. They can purchase their tickets when the early bird special goes on sale this Friday, June 29th and for those who love both metal and beer should take advantage of this special. The special early bird weekend “Metal & Beer” tickets entitle attendees to pours from each of the attending breweries all weekend long. So set your clocks this Friday because you don’t want to miss this discounted tickets. For more information about the upcoming festival including tickets, visit here. UPDATE: Today, the organizers behind the Decibel Metal & Beer Festival announced its second wave of performers set to hit the stages come the weekend of December 1st. The second wave of bands includes American melodic death metal kingpins The Black Dahlia Murder (Metal Blade), doom ‘n’ rollers Khemmis (20 Buck Spin) and craft beer-obsessed extreme metal veterans Trappist (Relapse). The festival welcomes Decibel Metal & Beer veteran Three Weavers as part of the breweries that are in attendance. This isn’t all folks, a final wave is in our future sometime this month. So check back for another update!